It is our distinct honor to celebrate an almost quarter-century partnership with Farmers State Bank in 2018. FSB employees have served for a combined 22 years on our Foundation Board of Trustees and committees. 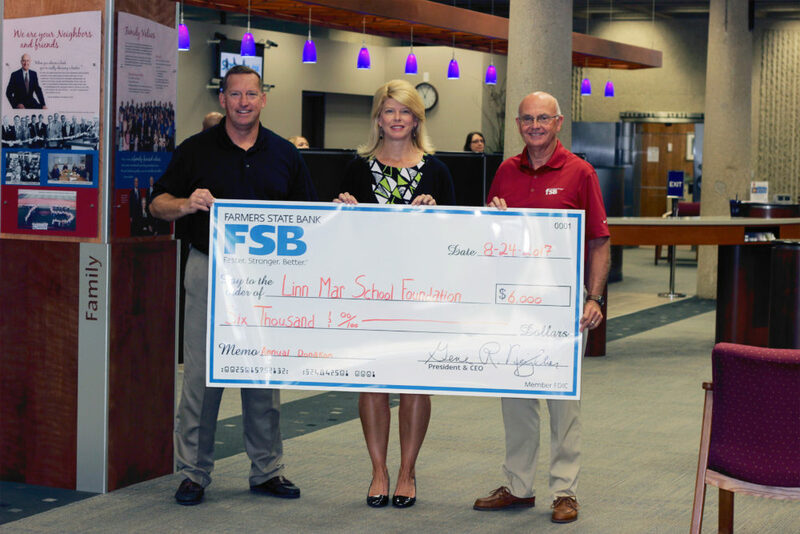 FSB has generously invested over $330,000 into Linn-Mar K-12 classrooms & programs through the Linn-Mar School Foundation partnership. Looking back to Linn-Mar’s early years of 1948 when our district was organizing 17 one-room school houses into a consolidated district (then know as Marion Rural Independent School District), FSB was there. As Linn County’s largest family-owned community bank, FSB has been serving the Marion community since 1927 and has always been an important corporate friend to our area schools. The bank has supported many other Linn-Mar groups and programs in addition to the Foundation with direct sponsorships of programs, support of student organizations, volunteer support and staff appreciation events. We extend a sincere and heartfelt thank you to our FSB friends for supporting educational excellence for our area students. They continue to amaze us with their tireless work and the philanthropic efforts they support throughout the communities they serve.